The day started early with breakfast with Elisha Buba Yero, Alejandrino, and Rachael. Before being a URI Trustee, Elisha was the Special Advisor on Religious Affairs to the Executive Governor of Kaduna State and Permanent Secretary in the Kaduna State Ministry of Religious Affairs in Nigeria. He is also Wakilin Kpope (The Ambassador to the Chief and Traditional Ruler of his Community) in Kaduna State of Nigeria. Nominally a Christian, he is good example of the way Christianity and traditional practices can exist side-by-side in a single person. Elisha told me about a spring in his village. It was down in a hole with steps leading down to it. Only women could collect the water, and then only if they asked permission and had a good heart. If so, the water would be pure and good. A barren woman could be made fertile by drinking such water. There were snakes and such down in the hole, but they would not bother such a woman. If a woman came with a bad heart, the water would not flow. There were trees around the spring, making it a cool, shady, beautiful place. If a man came and asked permission of the trees, he could cut one down and the next day it would be back again whole and sound. Elisha said that he had seen this with his own eyes. But now people are cutting down the trees for lumber and disrespecting the spring. He asked if I had any advice. I suggested three things: 1) Talk to people who remember the spring when it was still being properly taken care of. Collect their stories. See if there are old photographs of the place. Make it possible to tell other people the story of the spring and how special it was and could be. 2) With this information, talk to the government, business, and interfaith leaders, comparing the spring to their holy places – churches, mosques, and such – that they would not think of abusing in this way. 3) Work with the people of the village to restore the spring and its sacred qualities, and then make it available to others. Turn the people who live around the spring into its guardians and stewards in such a way as to help the economy of the village. All this has been successful in other places. We talked about how sacred items are treated as “art”. His people were part of the Nok civilization, which produced amazing terra cotta figures (http://en.wikipedia.org/wiki/Nok_culture). Elisha said that when sacred images are recovered by the Nigerian government from foreign museums, they go into museums in Nigeria when they should go back to the people they came from, to take their proper, traditional place in religious ceremonies and sacred sites. Why does plundering a sacred site suddenly turn sacred images into “art”? We talked about how the same ideas I mentioned above could be applied to create collaboration between national museums and local stewards of sacred artifacts. Rachael and Alejandrino joined us and Rachael filled Alejandrino in about all of this. Alejandrino shared a story about a man Rachael and I know from Peru – Alejandro – who, while working his fields, cut down a tree that was in the way even though he knew it was a sacred tree associated with a particular spirit. Immediately he was seized with back pain and bent over like the cut tree. He was not healed until he made proper offerings and apology to the site and left it alone. They had draped all of the chairs in flags of the Banner of Peace, emblematic of the Roerich Pact. Sande explained the story of the Banner and the Roerich Pact (http://en.wikipedia.org/wiki/Banner_of_Peace). These flags were gifts from one of the missing North American Trustees, Rebecca Tobias (Jewish / USA). Monica then set up a small Peace Pole in the center of the room (http://en.wikipedia.org/wiki/Peace_Pole) and led us all in the Peace Prayer. Liam Chinn, our Co-Director of Global Programs for Evaluation and Learning, led the first of several sessions on “Energizing the Network”, a handbook on helping Regional Coordinators and Regional Leadership Teams work with Cooperation Circles on participating in the URI. Liam’s parents are Irish Catholic and Confucian, and he grew up in an Inuit village in outermost western Alaska, so he truly has an interfaith personality and is very supportive of indigenous spirituality in URI. We started with small group and then general discussions of what a group gets out of being a Cooperation Circle. All the usual answers came up: NGO status at the UN. Connection to resources. Speaking with a global voice. Global validation of local actions. Partnerships. Knowing that you are not alone in your struggle. Building personal relationships that lead to a global sense of family. Strengthening the indigenous presence and voice. Etc. Liam asked how our CCs had provided a tangible benefit. I mentioned the stories from last night about how Multiregion CCs had helped others. Rachael mentioned the 1000 Kalema project, in which she had been instrumental, and how it had helped young people express themselves (http://1000kalema.org/). Lots of other projects, many involving reconciling once-warring peoples, were mentioned. Many involved youth. Audri talked about how her Trail of Dreams CC held a retreat for LGBT youth of different faiths and how empowering it was (http://trailofdreams.weebly.com/). Liam said that no other organization on Earth provides the benefits we do, even if we don’t directly provide funding. We provide access to funding and to policy makers. Mussie talked about his work with the African Union and the UN and how the URI, as an included NGO, can speak directly for the people when they meet. “At the Parliament Assembly that took place at the monastery of Monserrat in advance of the 2004 Parliament of the World's Religions, Mussie Hailu told me that in Ethiopia there is an indigenous, ethnic group called the Tabebe. The Tabebe possess the power of “tenkwe” – literally “far seeing”. The Tabebe speak with nature spirits. People go to the Tabebe to have their fortunes told, for charms, for healing, etc. So far so good. They sound a lot like Gypsies, or Witches. However, if a member of your family falls mysteriously ill, you figure out which of the Tabebe must have cursed the family-member… and kill them to break the curse. The government turns a blind eye to this. In fact, the Tabebe are considered so disreputable that they are not allowed to settle in cities, their children are not allowed to attend public school, and they are not allowed in the hospitals. When Mussie and his interfaith partner Sr. Laetitia Borg set out to create the first interfaith organization in Addis Ababa – a cooperation circle of the URI – he said that they should reach out to the Tabebe. Sr. Laetitia, like most people, didn’t see the Tabebe as a religious group and didn’t see a need to include them. At the next Global Summit of the URI, in Stanford CA in 1999, Mussie came up to me and (without any of this back story) told me that I needed to tell Sr. Laetitia all about Wicca. We had a long conversation over lunch, ended up friends, and did a blessing ceremony together with Charles Gibbs at the end of the conference. As they expected, religious representatives in Ethiopia asked why they were including the Tabebe, and they asked why they were using this symbol (the pentacle, associated with magic). Mussie and Sr. Laetitia explained that the pentacle is the symbol of Wicca and that Wicca is an internationally recognized religion that speaks with nature spirits, looks into the future, does magic and healing… just like the Tabebe. As lightbulbs lit over the heads of one religious representative after another, the Tabebe were accepted in the interfaith community, and this acceptance led to changes in government attitudes. It is now against the law to kill a Tabebe and such crimes are prosecuted. They can live in cities. Their children can go to school. They have access to health care. All of this directly followed from one group learning about another, and sharing that knowledge with people courageous enough to stand up for the truth, to the benefit of indigenous people half a world away. THIS is why I believe in the URI and why I think that a truly Global Indigenous Initiative is vital to fulfilling the mission of the URI." We analyzed how this story applied to other parts of the URI. We talked about empowerment of minority religion. We especially discussed how “invisible” indigenous / Pagan religions are. Anthropologists joke that “Haiti is 90% Catholic and 100% Voodoo.” But collectors of religious data are more likely to report that as Haiti being 90% Catholic and 10% Voodoo. I told them about the time I had lunch at a meeting of the world’s Interfaith Councils in Taipei with a Catholic Archbishop, a Protestant leader, and a Chief Imam from Uganda. I asked if their were any Pagans or Animists in their Interfaith Council. They looked at me quizzically. I tried again, asking about people who practiced the older, tribal spiritual practices that existed before the coming of Europeans. The minister, sitting in the center, gestured to all three of them and said “Of course. Us.” All of them continued to perform their traditional spiritual practices in addition to being Christians and Muslim. Dual-affiliation is almost never taken into consideration. If it was, Pew’s current numbering of the world’s Pagans (in the broad sense) at 29.25% of the population would skyrocket. As we waited to reconvene, I chatted with Biswadeb Chakraborty about the upcoming Global Indigenous Initiative gathering. We agreed that there is a tendency to equate “indigenous” with the pejorative “primitive”, with “marginalized”, and with “poor”, and so end up excluding a lot of traditions who should be included: many kinds of Hindu, Shinto, Taoists, and others. We need to embrace a larger understanding of indigenous, both because it’s the right thing to do and because it expands our economic base. Someone asked me what “indigenous” means and I replied that it refers to “spiritual traditions that have evolved as manifestations of a people’s relationship with the environment in which they live.” Biswadeb agreed. Biswadeb will be at the opening of the GII meeting and we will bring this up. I have always said that we need to develop a global indigenous economy in which practitioners of indigenous spiritualities in wealthier countries can help their bothers and sisters in less wealthy countries through assisting in building economic infrastructure. There is a BIG difference between sharing resources, knowledge, and skills between with brothers and sisters in a two-way exchange vs. going to the Church for a handout. One is empowering and the other re-enforces a powerless, subordinate status that started with colonization and continues today. Before we went back inside, Global Council Chair Kiran Bali (Hindu / UK) asked us to gather of a moment of silence in solidarity with then girls taken by the Boko Haram. This was all the more poignant in light of the information that CoG’s Greg Harder had sent to Rachael that 60 more girls had been taken yesterday. While we were still standing in a circle, someone pointed out that today – June 26, 2014 – was the 14th anniversary of the signing of the URI Charter in Pittsburgh PA. Everyone asked Bill to say a few words. Among other things, he said that his intention had been to create a “United Religions”, based on the model of the UN, but instead we had a “United Religions Initiative”. His intention had been to get the world’s religious leaders around a big table, but instead we had over 600 Cooperation Circles. So he was a big failure, but out of that failure came a shining star! I remembered that the Multiregion was supposed to do the opening blessing after lunch and dashed back to confer with my fellow Multiregioneers before we started. When I walked in, Karen Barensche, the new Regional Coordinator for the Southern Africa Region, with whom I had barely spoken, stopped me and said that when she first saw me at the ceremony at the Interfaith Center at the Presidio, she had assumed I was the presiding minister for the place, but then she got a psychic flash that I was Wiccan. She was the person who had spoken to Peter! * Rachael Watcher (Wiccan / USA) – Regional Coordinator, performed the Dryghtyn Blessing. * Patrick Nickisch (Hindu / Germany) – URI Representative at UN Geneva, read a Vedic hymn to the Divine Feminine. * Swamini Adityananda Saraswati (Hindu / India) – At-Large Trustee, did a Sanskrit chant. * Audri Scott Williams (Christian and Indigenous Cherokee / USA) – Trustee, recited a prayer asking for the blessings of the Ancestors from the four directions. * Vrajapati Das (Hindu / India) – Trustee, read an excerpt from a book by a teacher I didn’t catch. * Ed Bastian (Buddhist / USA) – Trustee, recited part of the Heart Sutra in Tibetan. Isabelle Ortega, our Director of Global Communications and Strategic Planning, led us through another process of identifying which communication stream was the best for finding information and for sharing information with the Global Council, the Global Support Staff, or the rest of the URI. We have: Social Media, Websites, Publications, Email Listserves, etc. I was fading by this time as, like many of the folks coming from other countries, I am used to a nap in the afternoon and that, combined with the heat and medications, was making me drowsy. Several other folks were drooping over, too. There were a LOT of good suggestions about improving and expanding our information flow – internally and to the rest of the world. Someone suggested a URI TV or radio show (or podcast, or whatever is the current version of the same idea). Marianne suggested collecting our best stories for a Jubilee book about the URI. Genivalda reminded us not to forget the blind or deaf. Monica suggested a URI story-a-day calendar. For our next exercise, Liam split us into groups of five, each of which was given an actual CC activity report from a real CC somewhere in the URI. We were supposed to evaluate the information for what it told us about how the CC was achieving (or not) its goals, how the URI might help it more, what it had to offer to other CCs, etc. Not just how many people met on what day to do what event. In other words, not Who? What? When?, rather How? and Why? When we all got back together, we brought all of these points up. Monica asked if we have an assessment of what the URI can offer CCs, in the form of resources, connections, etc.? Before we ended the session, Liam gave me a draft of the Energizing the Network manual for CCs. We all know in CoG that in grass-roots organization you can’t wait for everything to flow from the top. You have to be proactive and ask for things. This manual is a guide for CCs to get the most out of their participation in the URI. I am looking forward to going through it, since Liam and his team do great work and appreciate input and feedback. Victor explained about tonight’s home visits. We were all to take buses to designated homes of local URI supporters for dinners and schmoozing. These would all be folks who support the URI financially and are enthused by meeting and talking with the people whose work they support. I didn’t want to get in a situation where my hand and arm got worse and I was stuck with no way back, so I opted to stay at the dorm and find my own dinner. (Turned out it was at a Starbucks. There is surprisingly little around here.) It gave me a chance to work on reports. Enough gush. 2:00 am. Must be up by 7:30 am. Time for bed. Well, I thought the bus would be there any minute. After posting the last report I looked at my phone, saw it was 6:00 pm (a half hour past dinner) and dashed over to dining area. No one was in sight. I was joined first by Luz, one of the translators (with whom I had worked when Tata was here last year), and then Fr. James Channon. They had both stayed here due to not feeling well, but were doing better. Finally, around 7:00, the bus arrived and very tired folks started straggling in. I sat with Luz and Fr. Channon. We were joined by Marianne and Bart. Bart and I chatted about the CC he has with Morgana. He knew about different Traditions of Wicca and asked if Morgana and I are in the same one. As it turns out, we are – Gardnerians, but descending from different Priestesses of Gardner. I asked if he had seen my article in the latest issue of Morgana’s online journal, the Wiccan Rede (which they pronounce “raid”). (http://wiccanrede.org/2014/05/harran-last-refuge-of-classical-paganism-part-i/) He hadn’t read it yet, but knew about it as he and Morgana had talked at length about her own trips to Harran. Both Bart and Marianne said that the Americans talk to fast to be understood. I was surprised, since they both speak English very well. We had an interesting conversation about the difference between “constitution”, “statutes”, and “bylaws”, and about words that do not easily translate from one language to another. After dinner was the “URI Café”, with reports / performances from the Regional Leadership Teams from Latin America and the Caribbean (LAandC), South East Asia and the Pacific (SEAPac), and our own Multiregion. 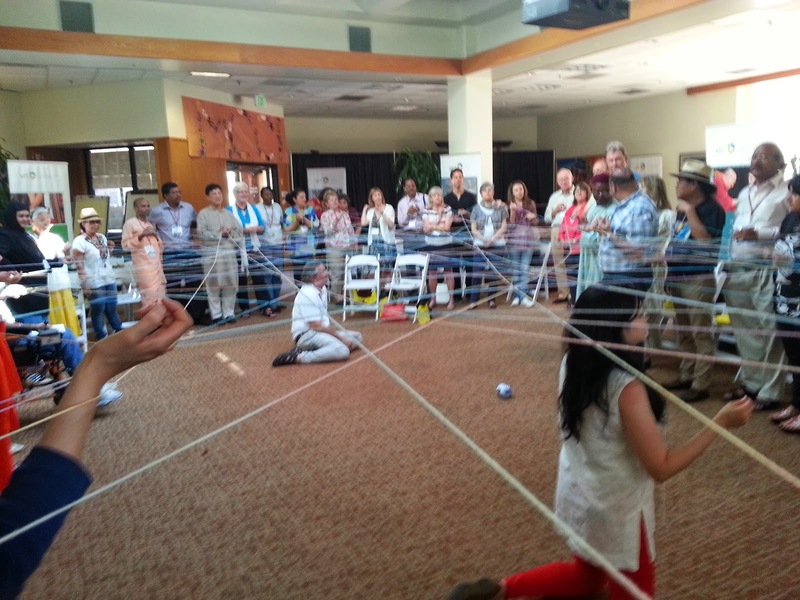 I confess that I didn’t get to appreciate mist of what LAand C and SEAPac did as our Multiregion RLT was scrambling to get our act together… literally. Unlike the geographically contained Regions, we have few chances for real conversations and so had little opportunity to prep a show, but it all came together at the last minute. Meanwhile, LAandC and SEAPac were leading songs and dances, doing video presentations, telling jokes, and more that was making us fear more and more that we would look second rate. A highlight for me was the last “act” before we went on… Potre, one of the RCs for SEAPac, had done research on everyone’s given names and read off the results. As most folks came from nominally Christian countries, most of the given names were Biblical or related and meant things like “Messenger of God” or “God is my strength” or “Purity” and things like that. Three that stood out as non-Biblical were Alejandrino = “Defender of Men”, Donald = “World Leader” (that got a few “oohs” and “ahhs”), and Victor = “Victor”. When it was our turn, Rachael, as Multiregion Regional Coordinator (RC), was our MC. She got us all up on stage and introduced us to the crowd. I went first. “Even people in the URI sometimes have trouble explaining the concept of the Multiregion to others. (For the record, it’s all CCs that have members in more than one Region, or have a focus that covers more than one Region (like “the Environment”), or who just want to be in the Multiregion. Virtual Region? That sounds like we don’t really exist. Non-Geographic Region? That sound like we’re nowhere, when in fact we are everywhere. Cyber-Region? We do tend to communicate electronically, but not all of our members have internet access. So then we started dreaming big. Instead of “Global Region”, how about “Planetary Region”? Or why not “Galactic Region”? And so we have plans t contact NASA to see if the crew of the International Space Station would be interested in becoming a Cooperation Circle. And you can bet that we’ll be talking to the crew of the first Mars mission before they go. If we can get the URI established on Mars, where would they fit in the URI? In the Multiregion, of course! So, in the spirit of “coopetition”, we look forward to the day when we have established the Perseus Cluster MCC – made up of several Planetary CCs – and can look back and wave at all the little Regions back on Earth. Lest anyone doiubt the commitment of the Multiregion to pushing boundaries, we offer a short video clip. The men you’ll see are in a Multiregion CC and are: Ali Bushnaq (Muslim / Palestine), Dudu Yifrah (Jewish / Israel), Sele Selamolela (Christian / South Africa), and Lance Trumball (Buddhist / USA) and our current webmaster. (People were in tears.) To find out what happened next, Lance would usually say, “Buy the DVD.”, but after a dramatic rescue effort, Sela was saved with only the loss of some fingers. This went over much better than I had expected. People laughed at the right places, expressed awe and sadness at the video, and were enthusiastic about the Multiregion. Rachael explained about the Multiregion and our 39 CCs – up by nine in just the last year, with another sitting in the audience waiting to be approved. She did a wonderful stand-up-comic-esque routine telling how the Multiregion was often overlooked because our CCs are also in geographic Regions. Mussie’s Golden Rule CC is associated with Africa, but it’s a Multiregion CC. Our work at the UN is associated with North America, but the URI at the UN CC is a Multiregion CC. Our work is also often invisible. In the LA&C presentation, Alejandrino showed video of his work in the Andes, but the digital video camera and training in its use was provided by the Think Peace Communications CC, a Multiregion CC. Alejandrino’s lessons in English – as well as those of former indigenous Trustees Rosalia Gutierrez and Raul Mamani – were provided by the Spirituality & the Earth CC, a Multiregion CC. Vrajapati showed a video about the annual Science and Religion conferences his CC hosts in India, with hundreds of attendees, including India’s President. The crowd loved our presentation. We closed with gathering all the folks in the room who are in a Multiregion CC for a photo. I’ll get a copy soon and post it. A tired crowd staggered across the campus to our dorm. I walked with Genivalda and Enoe. Genivalda speaks Portuguese and some Spanish. Enoe understands some Portuguese, speaks Spanish and English. I understand some Spanish. Between us, Genivalda was able to ask about getting involved in the Multiregion. We talked about a CC joining a Multiregion MCC like the Earth Wisdom MCC vs. her joining a Multiregion CC, like Enoe’s and my Spirituality & the Earth CC. All the latter takes is her asking Enoe and me and us saying “Yes.” She will think about it. Back in the dorm, I exited my shower and put on a galabia, only to discover two of my suite-mates Vrajapati (Hindu / India) and Patrick (Hindu / Germany) discussing their dietary restrictions and how well the university was accommodating them. We were joined by our last suite-mate Sherif (Christian / Egypt) and got into a discussion about how one of my coveners discovered a test for the presence of pork in food down to the molecular level. Eventually, the conversation turned to questions about Wicca and their desire that we had more time to lean about each other’s practices. They had seen my travel altar – with a stone from Coventina’s well – and wanted to know more. Sherif was especially interested in connections between Wicca and Islam. I promised to send him my paper on the subject – the result of working with Muslims in interfaith for 29 years. It now being midnight, we decided to continue the conversation tomorrow. I am writing about Day 3 and most of Day 4 today because almost everyone has gone off on a bus trip to Monterey. My arm can’t take the jostling and bouncing of a two hour bus ride so I opted to stay at the university and get caught up on reports. I am saddened since a lot of the fun stories from the conferences come from such side-trips. The day started off with a bang. The odd hours of getting up so early threw off my med schedule, so I missed taking the morning opiates on time. Just as the Asia Region started their opening blessing, I started going into withdrawal. It’s hard to make a graceful exit in the middle of a blessing. Off I went in search of water, which was remarkably harder to find than one would expect in the middle of a modern university. I found a tiny bit of blissfully desired shade to “chill” out (if you can call 80 degrees “chill”). A further 14 staff people were unable to attend. Asia is SUCH a large Region that an area like India becomes its own sub-region, with several sub-sub-Regions within it. With 220 Cooperation Circles (CCs), Asia is about one-third of the URI. 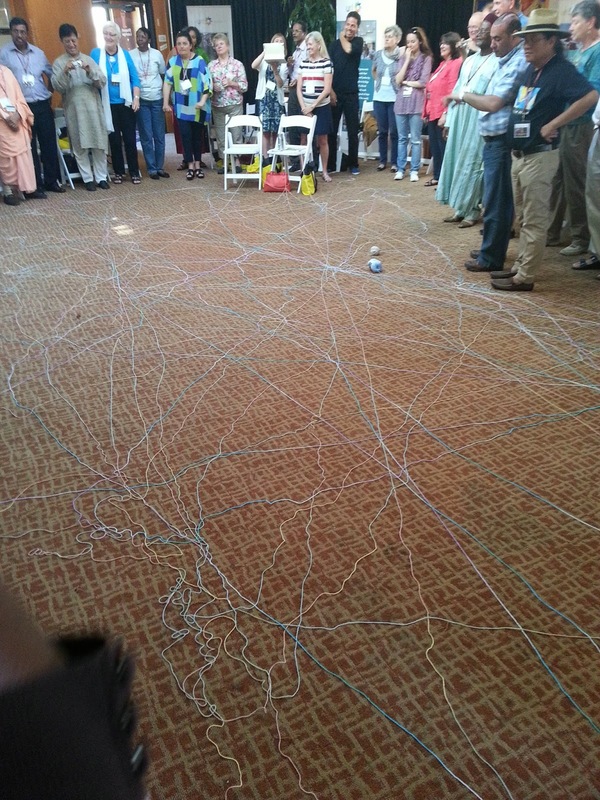 * Nurturing the Network – Supporting Regional Leadership Teams (RLTs), CC leaders, the Global Council, etc. including having more face-to-face gatherings (which are CRUCIAL for building relationships). 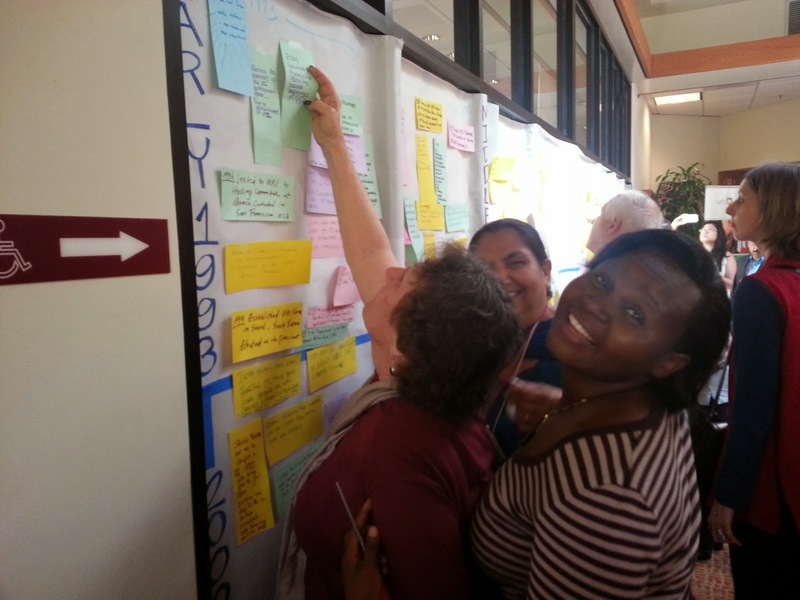 * Energizing the Network – Training RLTs & CC leaders, increasing connections, collecting and sharing CC stories of their successes, etc. We often talk about sharing “best practices”. Mussie said that we shouldn’t wait for “best”; “good” is good enough and leaves room for improvement. * Growing the Network – Adding / creating new CCs, moving into new sectors (like interfaith councils and educations), increasing our visibility in the world, etc. * Resourcing the Network – Taking a hard look at administrative and financial sustainability, developing financial support IN the various Regions, connecting more CCs withy interested sources of funding, developing more strategic partnerships with like-minded organizations, etc. 1) Working at and with the UN – There are huge opportunities for partnerships and funding at the UN, but the UN can be dangerous and confusing waters to sail in. If you don’t know the structure, culture, and language peculiar to the UN, you can end up closing more doors than you open. 3) Regional self-funding – The URI relies on large donations from Americans. To be truly “grass-roots” it needs to be self-supporting around the world. There are large donors out there in other Regions, but it is hard to convince someone in another part of the world to make a charitable contribution to San Francisco. We need to develop local economies of CC funding. * Better communication tech! – We desperately need it. Almost EVERY conference call at all levels of the organizations has people being dropped, static, echoes, background noise, etc. * Overcoming the perception that we are a religion. * Translation services! – This is huge! Almost everything is done in English. It is also EXPENSIVE! 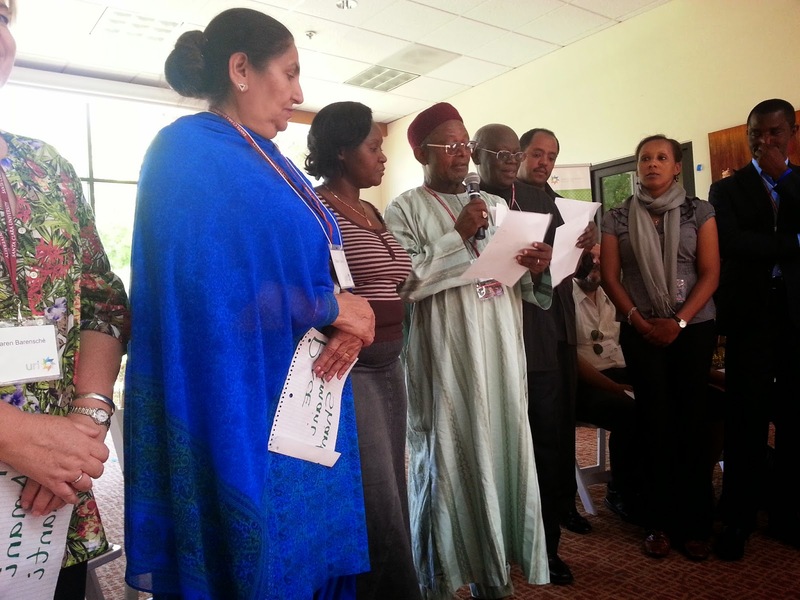 * Protection for peace-workers – It gets deadly dangerous out there when you are working to end religious conflict in Africa, Asia, the Middle East and North Africa, etc. * Engagement with local religions pre-conflict, during a conflict, and post-conflict. 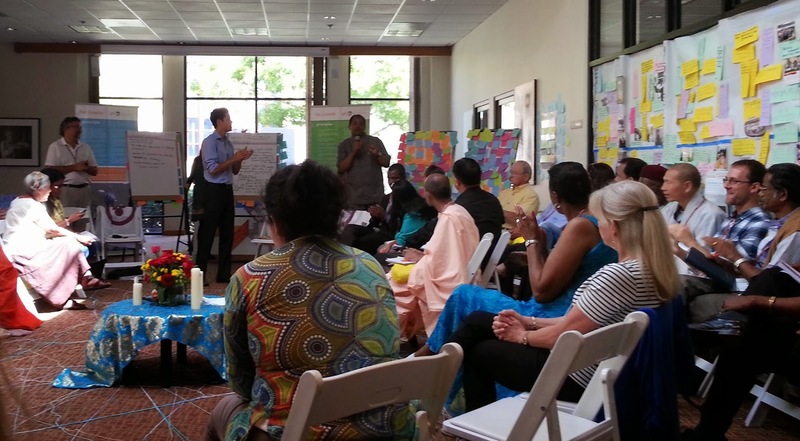 After a short break, we split into two groups, the Global Council (GC) and the Global Support Staff (GSS). Rachael went off with the GSS and may have more to say about what went on there. I don’t have as much to say about the GC meeting as I would like because one of the things we discussed was something in our Essential URI Handbook. There is a section titled “Key Principles of Good Practice for Individual Trustees” and principle 7 reads “A Trustee keeps GC deliberations confidential.” I asked for clarification about this, since I report to this blog. There was an interesting discussion in which I discovered 1) I am apparently the only person on the GC who is blogging about our meetings and 2) there are Trustees who could get into serious trouble / legal trouble / danger back home based on things they might say at a GC meeting. Everyone agreed that attribution of statements was out of the question, but beyond that it got vague. 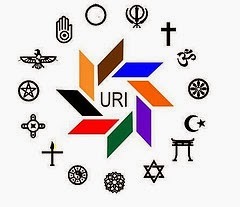 I have decided to use the standard that have used in the past with conservative Christians writing about the URI or other interfaith groups: I won’t say anything that any member of the public couldn’t have heard by walking into a meeting they could have attended or could read about in an official report published later. Since the session of the GC was closed, I’ll restrict myself to general information and to my own statements and actions until I get clearer on what principle 7 means. 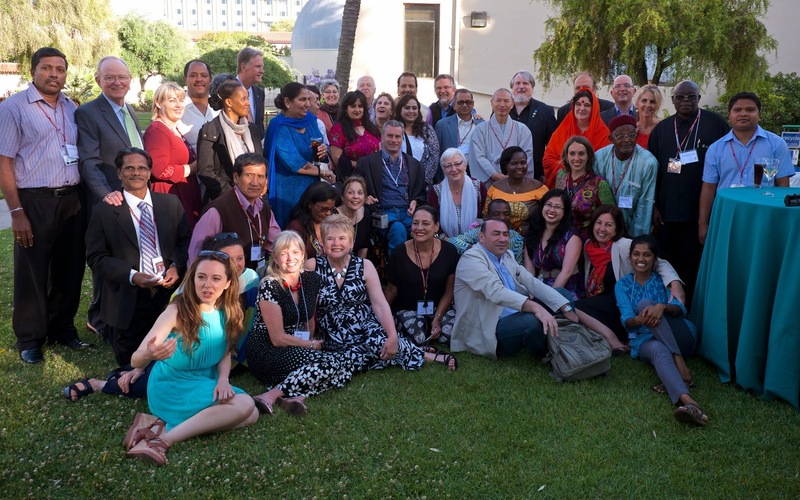 The URI moved to staggered terms this year and so Asia, Africa, Europe, and South East Asia and the Pacific (SEAPac) had just elected new Trustees. They and Ed and Swamini had to take their Trustee Oath of Office, so we all joined in in reciting it together. We each signed our own copies of the Oath, but one copy was passed around for everyone to sign. It will be scanned and put up on the URI website. This took us to lunch. * The Rev. Hierodeacon Petar Gramatikov (Orth. Christian / Bulgaria) – Trustee, gave a reading from Archbishop John Maximovitch of San Francisco. * Ms. Elisabeth Lheure (? / Spain) – Continuing Trustee, offered something in Spanish. * Ms. Karimah Stauch (Muslim / Germany) – Europe Regional Coordinator, sand an Andalusian song. * Mr. Matthew Youde (Christain / Wales) – Assoc. Dir. of Global Programs andYouth Leadership Development, gave a blessing in Welsh. 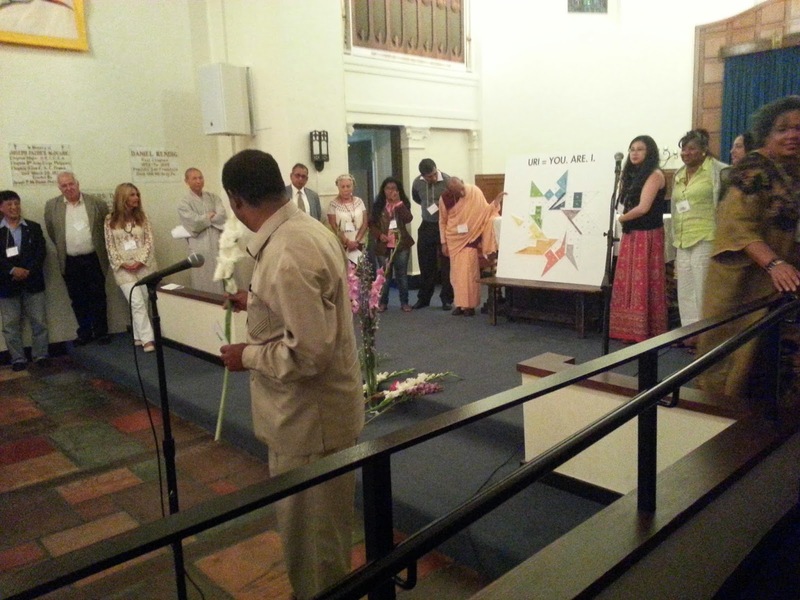 * Ms. Kiran Bali (Hindu / UK) – At-Large Trustee and GC Chair, chanted the Gayatri mantra. * Ms. Marianne Horling (Humanist / Germany) – Trustee, read from Corinthians 13. They distributed seed packets from Barcelona while Karimah and others sand a lovely song that went “Thy light is in our forms. Thy love is in our hearts. Hu Allahu Allahu Allahu.” Europe was proportionally well-represented, since they were only missing one staff member. They have 44 CCs. After that, we once again split into separate GC and GSS meetings. "Roles and Responsibilities" included a discussion of how important it is for every Trustee to contribute financially to the URI every year. I think it took a while for the idea that "the exact amount of the contribution doesn't matter" to sink in, as some of the Trustees from less-wealthy countries looked a bit disturbed. The point is that we have to be able to say truthfully to any potential funder that our entire Board contributes. This is a measure of a Board's commitment to an organization. (I have been asked to contribute on every non-profit interfaith board on which I have served.) But it's definitely a "from each, according to his ability" kind of situation. Genivalda made the suggestion, immediatley supported by all, that - whatever else we do - we each contribute 1 dollar, right here, in a ceremony in recognition that we are all commited to contributing and that we are all valued equally in doing so. We made a plan to do this later. We re-affirmed the existence and membership of the Standing Committee (Executive Committee), the CC Approval Comm., and the Finance and Operations Comm. Victor invited me to present two proposals. The first involved a report on the work over the past year of our Bylaws Review Committee, which I Chair. We laid out a plan for moving forward and asked that the Committee be approved. After quite a bit of discussion about the nature of Bylaws (a surprisingly Western term), the Committee was approved unanimously with a direction to be ready to be send materials to be voted on to the URI membership before the 2016 election, effectively giving us a year and a half. The second proposal – from me and the other Continuing Trustee Elisabeth Lheure – was for the creation of a “Wisdom Council” (We REALLY didn’t care about the name.). This would be a group of former members of the Board of Directors and the Transition Advisory Group (both of which existed before the first elected Global Council) and former Trustees who could serve as impartial mediators, advisors, ambassadors, or whatever the Standing Committee or Global Council asked them to do (and ONLY that). Again, there was quite a bit of discussion leading to the proposal being tabled for further discussion. We’ll see if it can be reshaped into something the GC supports. Dinner was followed by the first “URI Café” in which Regions showcased their activities, stories, humor, etc. That night is was Africa and Asia. I chose to head off to bed. The heat down here really doesn’t help nerve problems and I was wiped. Ciro led a meditation. Maria and Alejandrino read the Prayer of St. Francis in Spanish. Genvalda sang a song in Portugese (She breaks into song at the drop of a hat). LAandC was missing three staff people. They have 37 CCs. Today’s was a combined meeting in which we discussed and were led through exercises about communication systems in the URI, how they work, and how to use them better. At 10:30, folks gathered to take a bus to Monterey. I have stayed behind and used my time to catch up on reports for various organizations. URI isn’t the only one for me, and the others are falling behind while I’m here. It was great o get caught up, at least a bit. The bus should be here any minute now…. 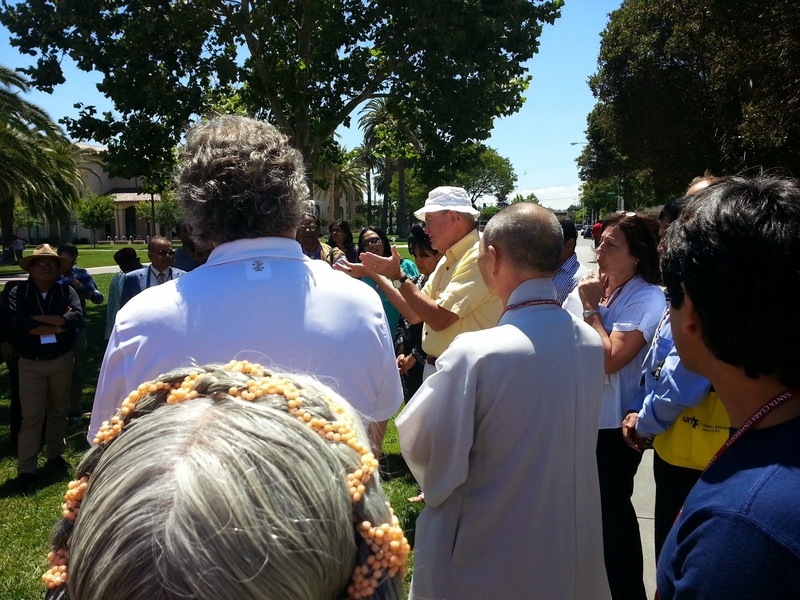 After breakfast in the hotel, we boarded buses (or in my case, my car) to head an hour further south to Santa Clara University – a Catholic college on extensive, beautiful grounds near San Jose. We settled into our rooms in one of the college dormitories and walked across campus to the lunch café. I sat with Alejandrino, Patrick Nickisch (Hindu / Germany), and Amity Bacon (Christian / USA). Patrick is the URI’s new representative to the UN in Geneva and Amity is Director of Communications and Social Media at the Global Support Office in San Francisco (what used to be called “the Hub”). We continued a conversation Patrick and I have been having about how the URI needs to better understand the different cultures of charitable giving in different parts of the world (rather than just assuming that everything works the way it does in the US) and also to explore different types of financial instruments to support an increasingly diverse URI community. After lunch, I found out who the other booklovers are as we ran into each other in the campus bookstore: African Trustee the Most Rev. John Baptist Odama (Christian / Uganda), URI UN Rep. Monica Willard (Christian / USA), Middle East and North Africa Trustee Sherif Awad Rizk (Christian / Egypt), and East Asia Regional Coordinator the Ven. Dr. Jinwol Lee (Buddhist / Korea). We all commiserated that summer session was not the time to find books in a campus bookstore. There are another ten staff people from Africa who could not attend. As the URI grows, it requires more and more infrastructure to support it. Africa now has 137 Cooperation Circles (“CCs”) and is growing fast. 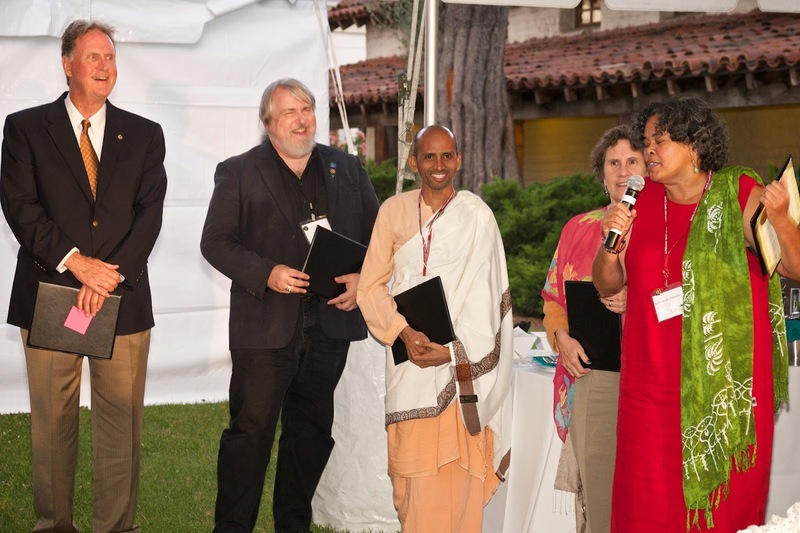 * 1998 – Hosting the “Pagan Lunch” with Deborah Ann Light at the Global Summit at Stanford University. With 15% of the conference-goers attending our lunch, the others became aware of us as a “way” of being spiritual, rather than a bunch of disparate groups. * 1999 – Founding – again with Deborah – the Spirituality and the Earth CC. With members in 12 countries in 4 Regions, it emphasized just how global the URI was right from the start. *2002 – Being sworn in as part of the first Global Council in Rio de Janeiro. The new Trustees sat in the center while everyone else placed hands upon us to empower us. Rev. Kelvin Sauls held my ponytail to transmit the juice to me. When everyone’s memories were up on the wall, it formed a remarkable story of URI highpoints. 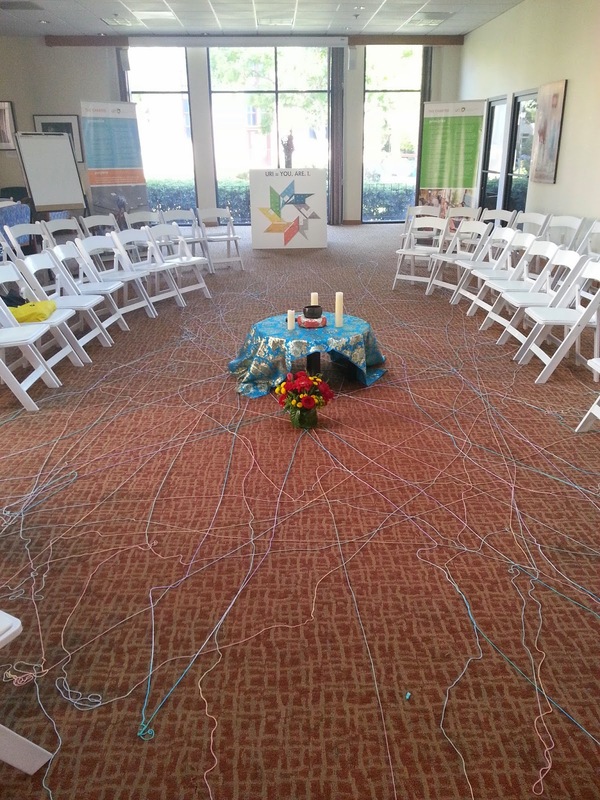 Our last bit of business (which was really just getting to know each other, especially for the new Trustees from the four Regions which had just had elections) was a combination exercise and ritual in which we formed a circle and tossed a ball of yarn around to form a huge web. Rachael and I both wanted to start singing "We are the weavers; we are the web...", but they already had their own song about "Weave, weave, weave us together..."
Finally, tonight was the Banquet, with all of us having dinner under a large tent with members of the President’s Council (the large donors and finders of funds for the URI), former Trustees and friends who live in the Bay Area, and representatives from local interfaith groups. One of the latter was Rev. Andy Kille, a Baptists minister who works with CoG’s Rowan Fairgrove on the new Silicon Valley Inter-religious Council (SiVIC). Andy’s sister is married to my brother. Alejandrino explained that this makes us “conconiudos”, a term that does not exist in English. At the end of the dinner, they gave out certificates of appreciation to the Trustees and staff – very nicely presented in cases. I will definitely get mine framed. 2014 URI Global Council meeting begins! When it rains, it pours. Last week it was working on sending the McDonald Windows (http://www.interfaith-presidio.org/mcdonald/) to the cathedral in Aachen in time for its observance of the 1200th anniversary of Charlemagne’s death. Then it was the annual meeting of the Interfaith Center at the Presidio, when its Sponsoring Organizations (http://www.interfaith-presidio.org/sponsors.htm) come together to share information about their social service projects and – this year – make fundamental changes in our Bylaws. Then it was preparing for NCLC to host a reception for the new Executive Director of the United Religions Initiative – Victor Kazanjian – where he can meet representatives from the multitude of Pagan groups in the SF Bay Area, followed by planning for the next People of the Earth conference, in which Neopagans, Immigrant Pagans, and Indigenous Peoples meet to share our spiritualities. 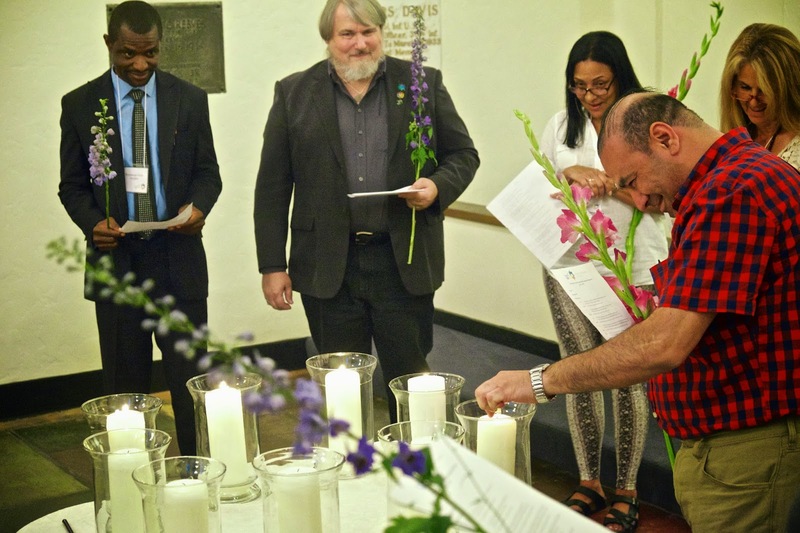 Interfaith work is a packed schedule of behind-the-scenes committee meetings and conference calls, punctuated with high-profile, public events. This weekend, Rachael Watcher and I started a week and a half of meetings with the United Religions Initiative and the Global Indigenous Initiative. Rachael was recently hired as Regional Coordinator for the URI’s Multiregion (www.urimulti.org) and I am currently serving my fourth term as a Global Trustee on the URI’s Global Council (http://www.uri.org/about_uri/global_council_trustees). The Global Council usually meets on conference calls since, with members in over 20 countries, it’s hard to get together. We have a face-to-face meeting once a year for about a week. Accompanied by the Global Staff of over 50 people (http://www.uri.org/about_uri/staff), the meeting covers URI growth, budget matters, committee work, administrative optimization, and much more. As is often the case, with the URI bringing people together from all over the world, other groups “piggy back” their meetings onto this one. The Global Indigenous Initiative is a URI effort to network Indigenous people around the world, to share wisdom and skills with each other and with the world. 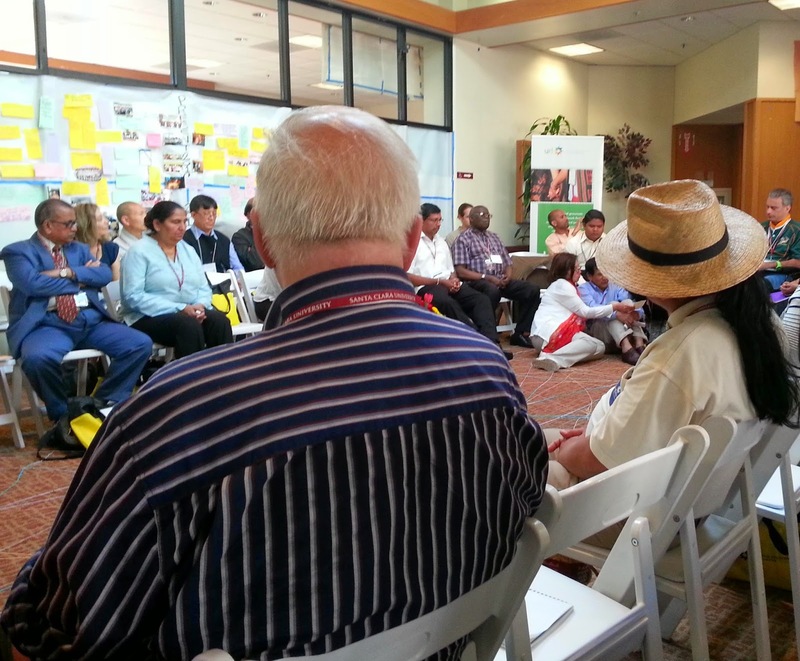 Rachael has been working closely with URI Trustees Audri Scott Williams (Christian &n Indigenous / USA) and Alejandrino Quispe (indigenous Quechua / Peru) to create this gathering of some 40 Indigenous leaders who will meet right after the Global Council Meeting ends next week. Anyway, Rachael will also be reporting on these events as we go. Friday and Saturday were for arrivals. Some folks required a full day several flights to get here. By today, Sunday, most of the attendees were here. 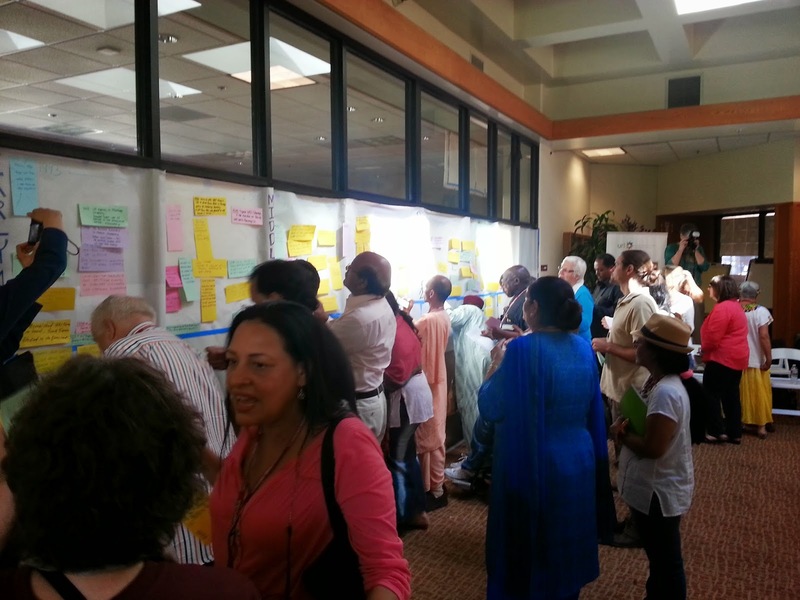 The meetings are in San Francisco, Burlingame, and Santa Clara. Since I live just across the Bay in Berkeley, I drove myself, but my car chose this weekend to breakdown, resulting in my not joining the group until the welcoming ceremony this afternoon at the Interfaith Center at the Presidio. The ICP and the URI have a special relationship. Many of the early planning meetings for the URI were held at the ICP. The early meetings of the pre-Global Council Board of Directors always included a reception hosted by NCLC CoG and coordinated by Rachael. More members of the URI’s Board and Global Council have been ICP Board members (8) than have been from any other organization on Earth. So… the welcoming ceremony this afternoon was at the ICP Chapel. Trustees new and old met each other, held flowers, lit candles, and sang together. Each of us had been given an oddly shaped piece of colored foam-board with a number on it and asked to write a core URI value on the piece. During the ceremony, we each placed our pieces on a board with pre-designated spaces. One-by-one, the pieces formed a URI star logo. After the ceremony, most took a chartered bus to the Doubletree Hotel in Burlingame; I took my car. At the Doubletree we had a meal together during which I was able to get caught up with some old friends. After dinner, Rachael and I met with Alejandrino to discuss the past and future of the Global Indigenous Initiative. Finally, after a long day, we retired to write reports and get ready for a day that starts at 7am tomorrow.